Is Nymeria the only remaining Dire Wolf? I know Shaggy Dog, Lady, Summer, and Grey Wind all have passed on. But is Ghost still alive? I can't remember if the traitorous Night's Watch killed Ghost as well. purple_hayes wrote: Source of the postI can't remember if the traitorous Night's Watch killed Ghost as well. He's still alive but we haven't seen him yet this season. Interesting fact that I missed since I haven't read all of the books. I just thought Euron's crew was being overly cruel. Good find. I noticed it too but thought the same thing as you. Tyler wrote: I'm sure I'll have more to post here when I listen to my podcast still this week, but something that struck me as odd and it hasn't been mentioned. Dany and Varyis were talking about Jon Snow and how they should get him there to make him an ally. I thought it was weird that conversation ended with Dany (I think it was her) saying "and force him to bend his knee". That doesn't sound like breaking the wheel if you force someone to kneel to you. Well, she did say to "invite" rather than "force" though the way she said it was pretty damn imperious. And is it traditional in Westeros to make marriage proposals on bended knee? I don't think that's what Dany had in mind at that particular moment, but we know she's conscious of the political importance of marriage eligibility and such a union has been widely speculated upon and anticipated by the community. Demanding an oath of fealty that ends northern independence from Jon Snow would be a fairly traditional sort of power play not necessarily in the spirit of her "wheel-breaking" ambitions, but I can't really see a great reason for that not to be her opening gambit. She has a strong army and a strong claim on the throne, and if the letter she had Tyrion send sounded too friendly and tolerant of the North's secession then I imagine everyone would be even more suspicious of a trap. Hopefully Dany would ultimately accept an alliance without allegiance from Snow if that's the best he could commit to. I expect the greater dilemma she'll face, though, is whether or not to resort to a scorched earth approach to conquest as she suffers setbacks and defeats in her current approach to the war. Artukka wrote: Source of the post the letter she had Tyrion send sounded too friendly and tolerant of the North's secession then I imagine everyone would be even more suspicious of a trap. Tyrion conveniently left the part out of the letter about Dany forcing Jon to bend a knee and follow her. I think Jon would do just about anything if he could get her army and dragons to help at the wall to fight the White Walkers. 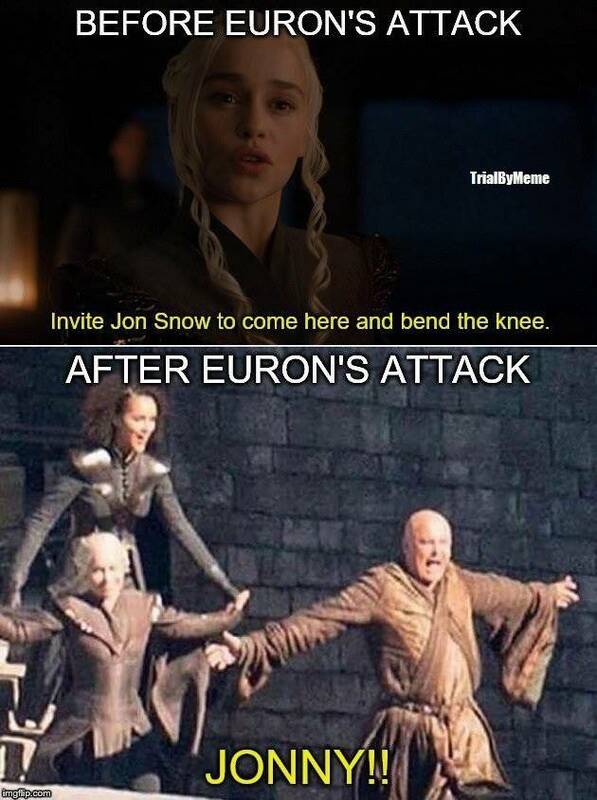 wags83 wrote: Source of the post I think Jon would do just about anything if he could get her army and dragons to help at the wall to fight the White Walkers. With Sansa kicking and screaming right behind him. I hate Jon and Sansa's relationship right now. I wish Jon gave her a heads up that he was going to be dropping these bombs in the meetings. CrckrJack wrote: Source of the post I hate Jon and Sansa's relationship right now. I wish Jon gave her a heads up that he was going to be dropping these bombs in the meetings. Why is it so hard to talk to each other before things happen?! "Hey Jon, Little Finger is kind of obsessed with me so I just sent him a raven asking for help in this battle. Let's stall for a few hours so the Knights of the Veil can get here and almost none of your men will have to die". Sansa: Okay, but talk to me about things before hand. And lolz at the pun. Woooooooooooooooooooooooooooow this is like second hand plagiarism.